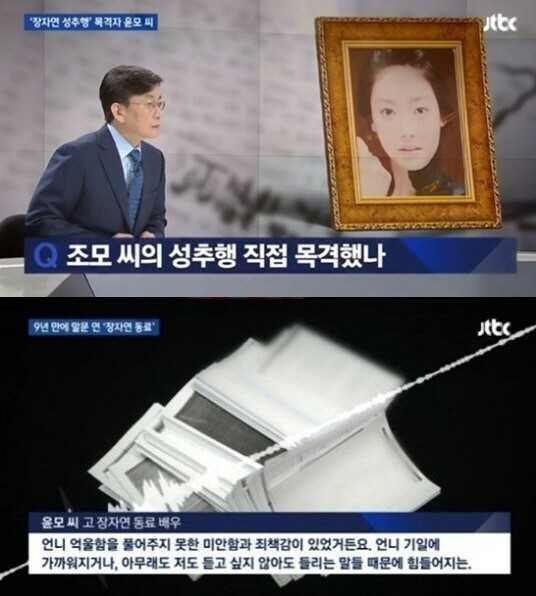 A witness of the sexual abuse case involving the late actress Jang Ja-yeon has gone public with her testimony through media interviews. The actress, identified only by her surname Yoon, was interviewed by local news networks JTBC and KBS on Thursday. As a close colleague of the deceased actress, Yoon claimed that she witnessed Jang being sexually harassed. Jang took her own life in 2009. She left behind handwritten notes, which allegedly revealed that she had been forced by the head of her agency to provide sexual favors to high-profile figures. The investigation into the matter prompted criticism from the public, as the prosecution did not charge prominent figures whose names appeared in the notes, citing a lack of credibility. In the interviews, Yoon said that she saw Jang being sexually harassed by a politician surnamed Cho. “It was the (agency) head’s birthday party. After dancing on the table, Jang was getting down,” she said. According to Yoon’s account, Cho, a journalist-turned-politician who was once a reporter for the Chosun Ilbo newspaper, grabbed Jang’s wrist and made her sit on his lap. “It was forceful. I remember, Jang tried to stand up multiple times, but was forced to sit down again and again. Meanwhile, he touched where he shouldn’t,” she said. The actress said she testified 13 times to police and the prosecution, but her testimony was not accepted. “I thought it was strange, they seemed to believe Cho, who was pointed to as an assailant. I was just over 20, unable to judge the situation well, but even for me, it was strange. After the investigation, I learned that Cho’s wife was a prosecutor,” she said. The prosecution is currently reinvestigating the case, as a special independent panel at the Ministry of Justice looking into past rulings recommended a reinvestigation. Ten years after the alleged incident, Cho was indicted by the prosecution before the statute of limitations runs out on Aug. 4.